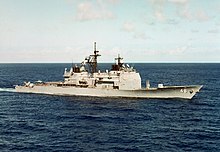 This list of cruisers of the United States Navy includes all ships that were ever called "cruiser". Since the nomenclature predates the hull numbering system, and there were several confusing renumberings and renamings, there are multiple entries referring to the same physical ship. A "*" following the entry indicates a ship that was canceled before completion. Ships in bold saw combat service. A "†" indicates a ship lost to enemy action. CA-1, CA-6 and CA-10 were never used, as ACR-1 Maine, ACR-6 California/San Diego and ACR-10 Tennessee/Memphis were sunk prior to the 1920 redesignation, and their sisters' original hull numbers were carried over. CA-20 through CA-23 were skipped with the merger of the CA and CL sequences, which allowed the reclassification of the Washington Treaty CL's as CA's without re-numbering. Heavy cruisers CA-149 and CA-151 to CA-153, and light cruisers CL-154 to CL-159 were canceled before being named. CG-1 through 8 and CG-10 through 12 were converted from World War II cruisers. 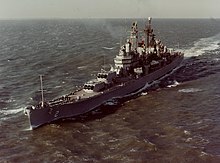 CAG-1 USS Boston and CAG-2 USS Canberra retained most of their original gun armament and were later returned to their gun cruiser designations CA-69 and CA-70. 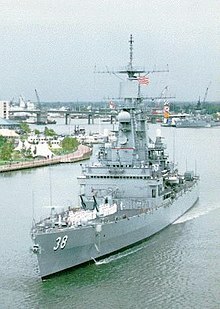 Before 30 June 1975, CG-16 USS Leahy through CGN-38 USS Virginia were designated DLG or DLGN (Destroyer Leader, Guided Missile (Nuclear powered)). They were redesignated cruisers in the 1975 ship reclassification. CGN-39 USS Texas and CGN-40 USS Mississippi were laid down as DLGNs but redesignated CGN before commissioning. CG-47 Ticonderoga and CG-48 Yorktown were ordered as guided missile destroyers (DDG) but were redesignated to guided missile cruisers (CG) before any ship was laid down. 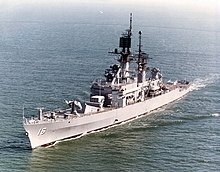 CGN-9 Long Beach, CGN-41 Arkansas and CG-49 through 73 were ordered, laid down and delivered as guided missile cruisers. 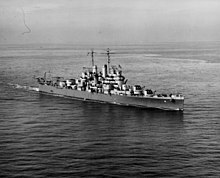 Long Beach was the only cruiser since World War II built on a true "cruiser hull", and for over ten years was the only new-build guided missile cruiser in the fleet. The Navy has 22 Ticonderoga-class cruisers (CG-52 through CG-73) in active service, as of the end of 2015. With the cancellation of the CG(X) program in 2010, the Navy currently has no cruiser replacement program planned. The Navy is looking to the AEGIS-equipped Arleigh Burke-class destroyers to increasingly fill the role of the cruiser in the protection of the carrier strike group, as it could be well into the 2030s before any possible cruiser replacement program is up and running. See also List of light cruisers of the United States. Note: in the pre-1920 period abbreviations were informal and nonstandardized; officially these ships were, e.g., "Armored Cruiser No. 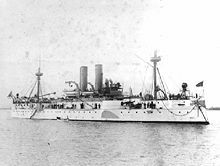 1"
USS Newark (C-1), the first of the numbered United States protected cruisers. In the pre-1920 period abbreviations were informal and nonstandardized; officially these ships were, e.g., "Cruiser No. 1"
On 17 July 1920, all First and Second Class Cruisers (armored and protected cruisers) still in service were reclassified as Armored Cruisers (CA). The armored cruisers had had their names changed from states to cities within those states to free up the names for battleships. In the 1920 hull designation system, of the Third Class Cruisers the fast Scout Cruisers became Light Cruisers (CL), and the slower New Orleans and Denver-class "peace cruisers" were reclassified Patrol Gunboats (PG). On 8 August 1921 the system was revised; the surviving protected cruisers (except for the "semi-armored" St Louis class) and the peace cruiser/patrol gunboats were all grouped with the scout cruisers as Light Cruisers (CL). 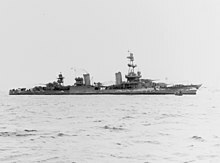 The cruisers laid down between the Washington and First London Naval Treaties were originally designated Light Cruisers (CL) due to their light protection. In accordance with the London Treaty, they were reclassified as "Heavy Cruisers" (CA) in 1931 due to their 8-inch guns. Thenceforward heavy and light cruisers were numbered in a single sequence; the last armored cruiser of the original CA series, Seattle, was redesignated IX (Unclassified Miscellaneous) in 1941. CG-43 to CG-46 skipped to allow redesignation of DDG-47 Ticonderoga without renumbering. This page was last edited on 16 February 2019, at 06:16 (UTC).